To a cinemaniac like me this is the prime season for movie watching. Many in Hollywood believe that movie adaptations of classic books are prime award bait. So they throw them all up in the screen in the last 2-3 months of the year. I think there is always a part of us that wants to see our favorite moments/characters/stories brought to life in front of us. Some of us want to see exact duplications of what we've created in our heads. Or maybe a new spin on a classic tale. I also think there are books that I never want to see adapted such as Catcher in the Rye, On the Road, and The Crying of Lot 49. Stay Away Hollywood! Stay Away! I know it's obvious, but Books are words, movies are "moving pictures." They can't be exact or it wouldn't be a movie. There is a common perception that the movie is never as good as book. Now I could go on. I think that there have been a lot of great adaptations. I think it all depends on what your expectations are. 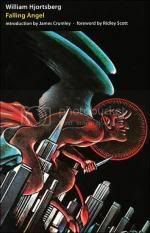 One of my favorite stories comes from Dashiell Hammett. He and a friend were sitting and talking. His friend asked Hammett whether he was afraid that Hollywood would take away his story and change it into something different. Hammett said that as long as the book is on the shelve that no one can take it away. Amen, Dash, you speak the truth. Here's a few that are coming this fall, all based on books. There is still time to pick up the book before these come out at your local cinema. Any others you all are looking forward to? 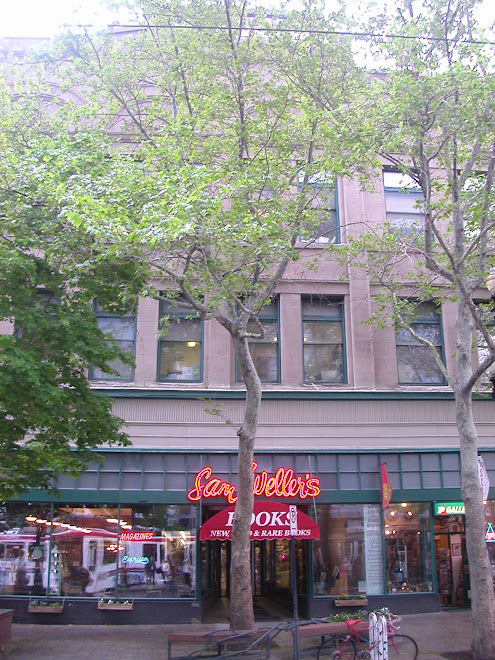 There once was a vacant retail space next door to Sam Weller's Bookstore. In the last while, this unoccupied building has become enlivened by storefront projections of short films by the Salt Lake Film Center. 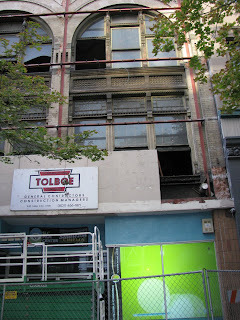 And now, much to the neighborhood's delight, an unveiling has gone under way: the property owners have begun to peel off the flat 60's facade to reveal the authentic turn-of-the-century architecture once obscured beneath. 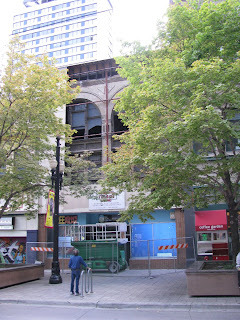 The art projections continue alongside this construction of de-construction, providing a wonderful juxtaposition of the old and new in our awakening strip in downtown Salt Lake City. Is it possible to have everything and feel as if you have nothing? Charles Ryder meets Lord Sebastian Flyte at Oxford in 1922. Through his friendship with Sebastian, Ryder is thrust into the center of a life of immense privilege. Ultimately Ryder ends up questioning everything that he believes about truth and faith. I had not seen the famous tv series, or read any Waugh novels before. As I understand this book is very different from his more satirical works. There is comedy in here, Waugh does an excellent job of skewering the wealthy. The frivolity and entitlement that appears in Sebastian's Oxford crowd is pretty amusing. Through the middle class eyes of Ryder one can see the intoxication of it all for a first time college student. They encourage and praise drunken partying but then bail when anything turns dangerous. The satire is ripe as they pontificate about art and bohemianism while drinking champagne served by their valets. Bohemians indeed, Waugh is winking at us. I was shocked but not surprised by how the Marchmain's react to Sebastian's behavior. Lady Marchmain is a well drawn character of someone who believes in molding and controlling her children's every move. Heaven forbid they be allowed to make their own mistakes and choose their own paths. Surprisingly in the latter third of the book Waugh takes on a serious discussion of the affects of Catholicism. Ryder's atheism and philosophy is very well paralleled by the Marchmain's stark Catholic belief. The fates of Ryder, Sebastian, and Julia make a stark argument that everyone needs faith of some kind. The comfort or pain of faith is determined by the individual. Waugh seems to indicate that religion is a reflection of it's patrons. This book was more philosophic then I thought it would be. It's a rich text and not nearly as stuffy as I expected. Waugh managed to pull me in. I was glad to be taken away to Brideshead at least for awhile. 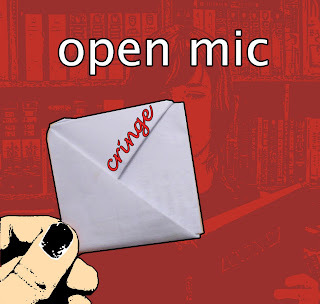 We're scanning and scouring our top-secret diaries, coming-of-age journals, steno notebooks, craftily folded love notes and high school literary magazines for the devastating poetry, the cringe-worthy material of our adolescence..and we hope you are too, because we will be holding our first Cringe Open Mic event this Friday the 12th at the bookstore, 7pm. Come to purge the past in front of a willing audience and join in the collective cringe sensation. Occasionally I like to dive into the Quarter Bin Comics because you never know what you might find. A little background for the uninitiated: The Quarter Bins can be found at the back of any comic section. At Sam Weller's there is a box sitting atop the graphic novel section. These comics are most likely loose issues sold for cheap. Here you can find discarded treasures which brings me to today's choice: Time Masters #1. This comic was released in February 1990, written by Bob Wayne and Lewis Shiner. Penciled by Art Thibert and inked by Jose Marzan, Jr. I picked it up because I dig time travel stories and the awesomeness that is Rip Hunter. Rip Hunter, as he is introduced in the first few pages, is a doctor studying time travel whose lab gets blown up. Hunter is torn up because he's lost his assistant and his boss, Magnus, will be pissed. In a cool flashback we learn that Rip became obssessed about time travel when his grandfather gave him a clock. (BTW his grandfather kinda looks like Gepetto in Pinocchio which makes me wonder whether this is for real or not.) It turns out that his lab has been sabotaged by the Free Masons who we learn about in an awesome 2 page spread. There's a great combination of Knights, George Washington, and a spooky guy in a hood. The latter half of the book is lightened by an appearance from 80s hero Booster Gold. I was delighted to see Booster Gold because I loved 52, where he's featured, as well as his current namesake comic Booster Gold. I think Booster Gold is a wonderful self-serving jerk of a superhero. However it is his partnership with the incredibly earnest Rip Hunter that stops him from total jack-assery. Booster agrees to help him find out what happened in return for more fame and glory. Now even I will admit that all this is ridiculously silly. The art is very old style as well. But part of the fun is how bad some of these comics are. It's okay to laugh at comics. And for the low price of a quarter that is an incredible bargain. If you are interested in any other of my book musings click here. Last Thursday we had the pleasure of hosting President of Best Friends Animal Society, Michael Mountain. 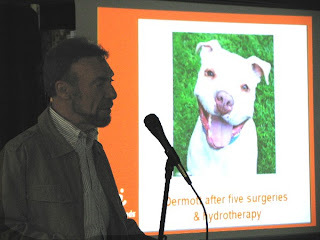 Mr. Mountain's presentation was inspiring and enlightening, as he informed the audience all about the history and ongoing efforts of Best Friends Animal Sanctuary and gave the details on his newest book, Dogtown. Dogtown is the special dogs-only section of the sanctuary, which provides a safe haven for neglected, abused, and rescued dogs as they rehabilitate and ultimately find new forever families. Dogtown, as well as The Cats of Kittyville are still available at Sam Weller's. Both books are published by the Best Friends Animal Society, and 10% of your purchase goes directly to help the animals at the sanctuary. All in all, the event was a success. Four adorable dogs also attended and we have some cute pics of them here. Today I received the annual reminder of the passage of time. Yes, August means it's time for calendars. All of a sudden the rest of the year hits me like a freight train. Before we know it will be winter and then 2009. I never thought I could be so accelerated by the sight of an Edward Hopper reproduction surrounded by boxes. I think it was Foucault who noticed that humans tend to focus and organized their time rigidly into schedules and workouts. He is right of course I realize as I schedule my workout. The instant need for organization crops up as I look at day planners featuring dogs or flowers. Is it the chicken or the egg? Do I feel the need for a calendar because they exist? Or do calendars only exist if I need one? An existential dilemma to be sure. Anyway Sam Weller's does have some fine new calendars out, I'd suggest giving them a look. If you'd like to read more of my book musings feel free to click here. Is there a song or artist that you feel defines a moment in your life? 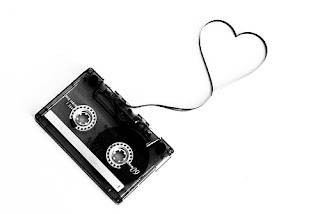 In his debut novel Love Is A Mix Tape writer Rob Sheffield uses music/mix tapes as a framework in this memoir. As someone who also likes to surround herself with music I could easily understand this correlation of music and memory. It is an excellent device and I enjoyed the mixture of the aural and the written word. Sheffield mostly discusses music of the late 80s and 90s which is an era that I know very well. I think because of that I was able to connect with several chapters especially his chapter about Kurt Cobain. However the problem with this is that if you have not ever heard of the music that he's talking about then your enjoyment can be limited. I think that Sheffield makes up for that by inserting an immense emotional hook. His elegy to his wife is heartbreaking and even had this stoic tearing up. Using music to cope with grief Sheffield is not afraid to show honest emotion on the page. It is this aspect that I think creates a universal appeal.